Independence Hall is part of the Independence National Historical Park. 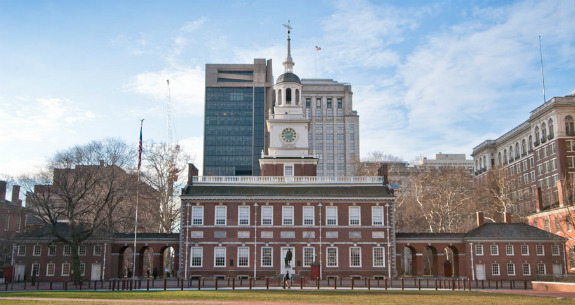 When visiting, "there are lots of other significant historical sites close to Independence Hall." The building is close to other historic sites like the Liberty Bell, Congress Hall, Old City Hall, Constitution Hall, President's House site, Franklin Court buildings and many more. It is recommended to "plan accordingly" and "take your time and spread it out over multiple days or multiple trips. There's way too much to see and to rush through it all is just as much an injustice as not seeing these treasures at all." Visit the National Park Services website. They provide plenty of information on all the elements of the Independence National Park including operating hours and ticket information. Download the park's free app, NPS Independence, for the best park map, visiting information and audio tours. It is also possible to reserve your free tickets to the Independence Hall online, a service fee of $1.50 per ticket will be charged to you. Most crowded: June, July and August. Best months to visit: September and early October when the weather is still warm, but there are fewer crowds. Entrance to Independence Hall is by timed entry ticket only from March through December. No tickets are necessary for January and February and after 5pm during summer. Start your tour at the Independence Visitors Center to get tickets for the tour, view a list of scheduled park events for that day and to watch the short films, Independence and Choosing Sides. After getting your Independence Hall tickets, head over the Liberty Bell first so there are fewer people and a shorter security waiting time. 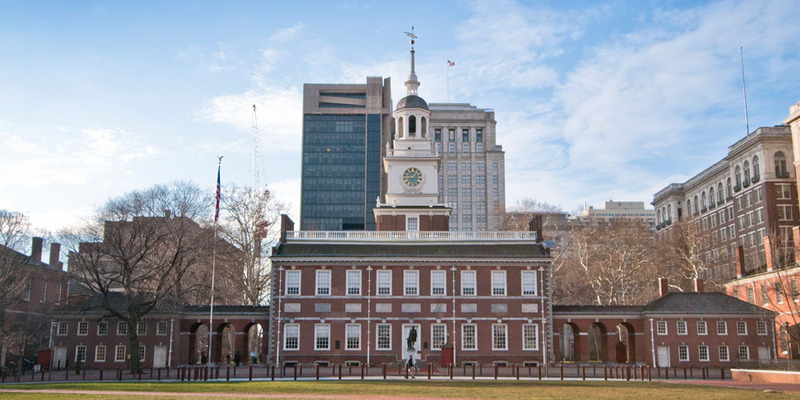 There are plenty of nearby historic buildings and sites to visit aside from the Independence Hall and Liberty Bell. See the list below. Arrive at least 15 minutes earlier than your designated timed entry ticket. This will give you time to go through security. Maximize your visit to the park and minimize your security screening time by bringing only small bags, if necessary. No food or drink is allowed in this pavilion. You will need to empty any metal or coin objects from your pockets. If you want to see the Liberty Bell but don't have the time to wait in the line, you can see the back of the Liberty Bell facing a glass wall which can be viewed from outside. If you are planning a trip in the summer, I highly recommend visiting over the week of Independence Day. Philadelphia holds the Wawa Welcome celebration for a week up through Independence Day. There are concerts, parades, block parties, food events, fireworks, and each day different museums are free. If your interest is in unique fun, the events can make your trip one of a kind! If your interest is museums, the free museum days can save you a load of cash! Encourage your kids to ask questions to the Park Rangers or answer historical questions in exchange for collectible trading cards featuring famous American landmarks and people. These cards are great educational materials and are free souvenirs from your trip. Kids will enjoy the Junior Ranger program which gives them a chance to earn a badge when completed. The park offers two Junior Ranger programs.The Junior Ranger for iPhone and iPad gives kids a way to interact with the park's stories on their mobile device. The Junior Ranger Activity Booklet requires kids to learn facts about park sites. The Federal Reserve and The U.S. Mint are just two-three blocks away. Both are self-guided tours and no tickets necessary. There is much history to explore - from the Georgian architecture, to Peale's Museum, to fugitive slave hearings - in addition to the founding of the nation.